Just a little musing about this full moon eclipse coming up in 22 degrees Leo. I’m calling this full moon and eclipse the Chiron Activation eclipse. It sits exactly on my Chiron, activating an opposition with my moon (so sun is conjunct my natal moon also), a trine with my North Node, and a square to my Pluto, as well as some other minor aspects with Mars and Jupiter. When I first saw this, I’m going to be honest, I panicked a tiny bit. I turned to Bernadette Brady and her awesome book The Eagle and The Lark which informed me that this saros cycle is a positive one. There may be a pleasant surprise, a lucky break, and/or sudden joy. This is further supported by the easy, free-flowing energy between the Sun, Jupiter, Moon, and Uranus, which gives us a mystic rectangle. Each of these planets are working together. The Sun and Moon are of course opposing along with Jupiter and Uranus- this creates friction that the trines and sextiles easily use to create positive change. There is a spiritual energy coming from this eclipse and the prediction of sudden joy, pleasant surprises, etc. are easily seen as these energies play with each other. Though Chiron isn’t making a major aspect to the eclipse, he is in a quincunx, adding some annoyance to what the Moon is trying to achieve. I’m taking a look at the energy of my natal Chiron because of the conjunction it’s making to my chart, but I suggest taking a look at yours also. Eclipses can hit on emotionally charged times, especially with this full moon showing its face, and I feel Chiron could always use some attention during them. How can you heal yourself from past wounds or restrictive thinking that is bringing you down in order to allow yourself to thrive? This eclipse IS about thriving, so take the steps to free yourself from mental and emotional chains. Don’t let the annoyance keep you from the potential this eclipse can unlock for you. On a further note, anyone else super excited for CHANGE? From negativity to healthy expressions, from being stuck to soaring? This Leo energy can re-spark your creative flame. It can help you discover your true self and how you can live your life as authentically as possible. Embrace it, enjoy it. Much love to you all. Happy full moon eclipse! I am unsure how to start this post because there is simply too much to say about this full moon coming up in less than 12 hours. I know I’m late in posting this, and I even tried to avoid the responsibility I felt in writing something about it, but here I am…being pulled in…as Luna does every time. Welcome to the Cancer Full Moon energy, the truest of all full moons, the deepest part of the moon’s soul. Luna is opposing the Capricorn Sun, sending a message to us about our emotional nature and the way we structure our lives. For me, personally, I see this message quite clear. This particular full moon sits right on top of my Mars, urging me to take to heart the lessons the Cancer Full Moon is shining in my face: feel and don’t stop feeling. Don’t apologize for feeling. Live to the point of tears, as my dearest Albert Camus said (also shares with me the same Mars placement in degree and sign, as well as Sun/Moon/Mercury!!). I am truly grasping this concept, learning that these tears are not always sad, but can be beautiful as well. Embrace the beauty that brings you to tears. Enough about me though, what does this mean for everyone? It follows along the same lines. Take a look at how you live your life- are you forcing yourself to repress certain emotions? Are you allowing your emotions to rule your life? Are you feeling numb or apathetic? Are you feeling overwhelmed and manic? All these things can relate to being too heavily reliant on one side of this teeter-totter. If you feel like Capricorn is weighing too heavily on you to where you can’t find joy in simple things or you’re too exhausted to enjoy relaxing at home and with those you love, then look to Cancer and bring some nurturing into your life. If you feel like Cancer is weighing too heavily on you to where you’re depressed, lonely, or letting your emotions get the better of you, look to Capricorn, set some easily achievable goals and go for them, bring a little more structure to your life, but don’t forget to do so while having an open heart. In general, this full moon is making some rough connections with other big players in the horoscope for Thursday: A Grand Cardinal Cross to be exact. It urges us to get moving but also cautioning that it’s not going to be that easy to do so. Lessons are being dished out left and right, so navigate with care. In fact, rather than physically ‘getting moving,’ I suggest making a plan first. The full moon is opposing Pluto which is conjunct the sun, transforming ourselves in order to better connect with our emotional nature (that’s the goal at least) as well as squaring Jupiter and Uranus (think wide-scale and sudden). Jupiter and Uranus are of course squaring the sun/Pluto as well, forcing us into the widescale transformations. If this is making you panic, stop, take a breath, and listen. YOU have the ability to transform this intense energy into something beautiful, something healing for yourself. The way to survive any transit, no matter how ‘possibly difficult,’ is to go at it with an open heart and to learn to let go of all that is unneeded and to trust that this is boosting you toward where you are meant to be in order to be the best version of yourself. The stars will bring the energy, it’s up to you to use it in a positive way. So get excited! It’s a great time to make goals, set resolutions, create intentions, meditate, focus on compassion, write down your feelings, etc. The full moon wants to cradle you in her arms, whispering secrets of the universe into your ear until you fall fast asleep and dream up ways to create a beautiful reality. Saturn and the Sun are exactly conjunct today. The sun is trying desperately to keep in the mood of Sagittarius season, but with Saturn on top of him, it might be difficult. Even in Sagittarius, there may be extreme pressure from the cosmos today. You may not even know where this feeling is coming from. Take some time to relax, take deep breaths, and realize that whatever is happening will pass. You can work extra hard to create your vision of the future when the sun leaves Saturn’s realm, but at this point, feel free to either hone in on that energy if you can handle it, or ignore Saturn telling you GET IT DONE NOW, because it’s really not worth the stress. The Moon has also teamed up with Uranus, creating an unsteady feeling in MY stomach, and possibly yours too. Uranus here can cause sudden upsets, especially in Aries and with Mars connecting so closely in a sextile, so try and stay clear of arguments and appreciate individual approaches. Uranus on the moon with Saturn on the sun can create discord, and the energy of the two are firey and flowing easily between each other with a trine, possibly making you feel uneasy and uncomfortable. There may be an excess of emotional energy that you have no idea what to do with. Mediate, write, draw, do anything to get that energy out! It needs to go somewhere or it’ll manifest in other ways. Hello all! As most of you know, tomorrow (October 23, 2014) there is a Solar Eclipse happening! It is exactly on 0 degrees of Scorpio, meaning it also marks the end of Libra season and the beginning of Scorpio season! Time to celebrate! But first…we should probably discuss tomorrow’s big event…just to clear the way for the festivities ahead. This specific Scorpio solar eclipse also directly precedes Mercury turning direct. Take that as you will…but be careful with your words around all that impulsiveness, try to wait till Mercury is direct before voicing something risky. Now what does this have to do with you…well, here it is- it’s shadow work time. This eclipse is bringing out the muck that the Mercury retrograde stirred up inside you, brought to the surface, and is forcing you to not just look at it but to deal with it. That which has been pushed into the unconscious will manifest with a solar eclipse, and so think about the lunar eclipse energy you felt on October 8th when Aries was reigning the lunar realm. What emotions were felt? What thoughts went through your head? What issues were you dealing with? What did you choose to ignore? All these things are coming back up, ready for their spot in reality, and the sun will push them out of the realm of possibilities and into YOUR realm. This can be awesome or awful, but either way, acceptance is key. As I have said many times, and will say many times again, Scorpio is all about LETTING GO. This eclipse will show you what you need to let go, and what to replace it with. It’s about new beginnings, and will create new beginnings for the next 6 months. It’s also about endings, however, so deal with them gracefully and count your blessings instead of feeling distraught at losses. Trust in the way of the universe, the divine order of things, and set intentions you can manifest to make your life more meaningful to yourself, and therefor more fulfilling. Relating to others is a huge theme, so take a look at how you relate to those around you, and see if there is anything lacking or something you can do to improve communication and connection. This is a great time to share your feelings with other people, those that you love, and to spend time with them. Spending time in nature or surrounding yourself with what makes you feel beautiful, and what you find awe-inspiring, will lift your spirits ten fold during this eclipse. Treat yourself and those you love to the royal treatment and let the worries slip away. Everything is already all right. The eclipses this April are quite powerful as some of you know already! The first is in a couple days, the 15th in the very early hours, and is a total lunar eclipse. Lunar eclipses often highlight inner emotional situations. We will most likely get a rush of emotion propelling us toward the physical manifestation of the solar eclipse on April 29th. Whatever the lunar eclipse makes you feel or brings up to the surface and forces you to reconsider is what will need to given attention to. So pay special attention to the inner workings of your mind and heart during this time. If there is something you feel needs to change and you resist the change, then the solar eclipse on the 29th isn’t going to be pleasant. It will be a Uranian disruption, a random event spinning you into action, whether it’s positive or negative is your decision. If you choose to take responsibility for yourself and deal with what you know you need to deal with then you will reap the benefits come the solar eclipse. If not, fate will interject and force the change. The lunar eclipse is in 25 degrees Libra. This means that the sun will be in exact opposition at 25 degrees Aries. This already tells us that we are dealing with identity regarding our self and identity regarding others. The house that the eclipse occurs in your natal chart will expand this even further, the opposition will show the axis of which you will be dealing with. So align your chart up with the transit chart for the 15th (around 3:45a.m. but depending on where you are located so play around with it) and see where the moon and the sun fall. Any planets hit in conjunction, opposition, or square are highly important. That means there could be multiple houses included in the interpretation as well. Remember, Libra is a cardinal sign, so any cardinal sign will also be affected or even cardinal areas in your chart just not to an extreme degree. This is especially so if it’s around 25 degrees. 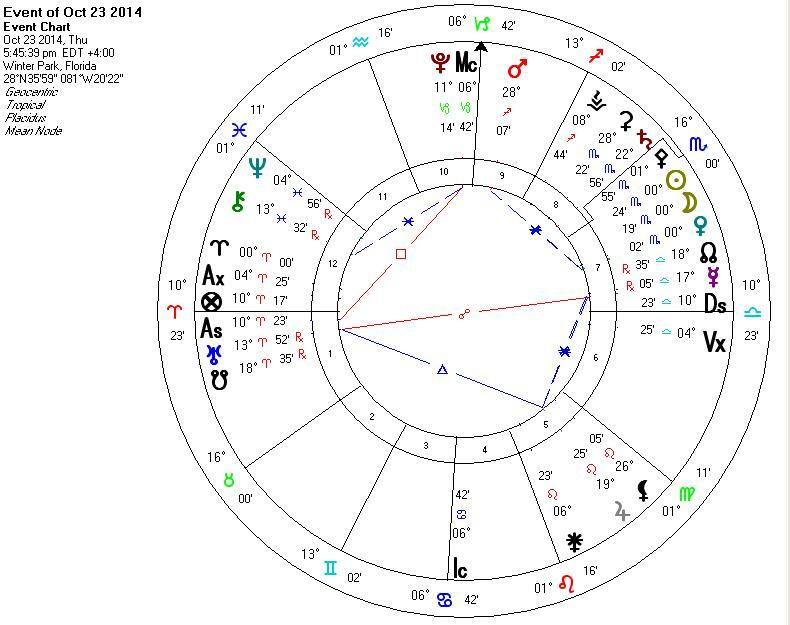 Now look at your chart for April 29th when the sun and the moon align in a conjunction at 9 degrees Taurus. What house do they fall in? The opposing house is equally as important. This will show you the axis that the solar eclipse hits and where the ‘disruption’ will occur (or benefits to be reaped). Find any planets making an opposition, conjunction, or square and deem them extremely important. These will be the areas the solar eclipse will physically manifest. Remember, the solar eclipse is external. The lunar is internal. Keep this in mind when making your interpretations. The solar eclipse is in a fixed sign, so any fixed signs will be especially affected. Mostly those around 9 degrees of a fixed sign. I am personally thankful the lunar eclipse gives us an internal ‘hint’ at what we can expect to manifest physically come the end of the month so we can prepare. Just make sure to take things slow, expand your awareness, and remember that like is meant to be enjoyed not fret over. So don’t be stressed out, just take responsibility for yourself and stay on track. Follow your heart and your own intuition. Feel free the message me about the eclipses and where they are hitting your natal chart. Sending love and light your way. The cosmic weather for this month is pretty intense. I am only going into two of the patterns but it includes a whopping 7 planets! This April Mars and Uranus will be opposite each other and Jupiter and Pluto will be opposite each other and each of these planets will all be square each other- creating a CARDINAL grand cross- therefor in the signs of Capricorn, Aries, Cancer, and Libra. It will not only be an extremely volatile time for the cardinal signs, but for the world as a whole. These are all big players! Jupiter is expansion, Pluto is what is being washed away to provide for something new, Mars is action taking BUT it is retrograde so it instead is more negotiating with yourself with what actions must go and what must stay (there will be a lot of Mars energy pent up inside wanting to get out but avoid acting compulsively! ), and finally Uranus is change and possibly even awakening, it is exposed truth. In regard to the world as a whole, the Jupiter/Pluto opposition is far reaching destruction. A washing away of the old way of thinking on a large scale. This can be indicated by unexpected events (Uranus) and violent events (Mars) forcing people to leave behind what they no longer NEED. I say need because ‘desire’ or ‘want’ is most likely going to be completely transformed, as these are ruled by Mars and Mars is in opposition to Uranus, feeding the revolutionary energy and newness Uranus represents. To ease this rough grand-cross there is shortly after a grand-trine between the moon, Mercury, and Saturn. This Saturn placement is in Scorpio retrograde, making reality feel heavy, intense, and highly personal. Luckily, the water grand-trine will allow this internalized feeling of restriction to flow easily through the emotions and communication. To ease restriction, we must let out our fears and what we perceive to be holding us back. We can easily connect this with our emotional nature and communicate it to others so we don’t feel so alone. This trine is in water, so it will naturally fit in well with Jupiter in Cancer which is a benefic, as well as focus primarily on emotion and feeling. I predict there will be a lot of open communication between people during this time about heavy subjects in order to release the old fear patterns and be cleared up of any weight on our chests so we can get past this transition and start new. This is, after all, Aries season and we are all aimed towards creating and enjoying. Use this trine to help with any difficulty the grand-cross is creating in your life- allow the water (emotion) to flow through you and be open and expressive of what you’re feeling. For you personally, look at a transit chart up against your natal chart and find what houses or planets these four are moving in or across. Pluto will show you where you will have an inner transformation and where your own old ways will be wiped away with force or with cooperation- it is your decision. Uranus will show you where you will either face unexpected changes or gain bursts of new insight. Mars will show you where you need to compromise and where you wish to take action but must wait for now. Jupiter will show you where your life will be expanded or where you need to put more ethical reasoning behind. Good luck with the cosmic weather this month, and make sure to keep an open mind and allow the grand-trine to help you out a little bit. The theme is transformation, new insights, global change, inner change, emotional clarity, new beginnings, staying steady, and not letting the turmoil override your inner sense of peace. Meditate often if that’s something you do from time to time, or least spend time in nature. WRITE. I cannot stress this enough. Keep an April diary! Write all the things that come into your head. And keep those chins up! Though I knew the Mercury retrograde was coming up, I just now realized that I am going to be traveling through the thick of it! I leave the 11th for Arizona and Colorado and return the 22nd! I shall name this trip one for immense self discovery. It’s going to be a wild ride but I’m pleased to be out there in the midst of the energies, exploring other areas, people, etc. In fact, my solar return has Mercury retrograde in it, so I have a feeling that this period is going to be more fruitful and inspiring than a normal retrograde for me. You can look up your own solar return at astrotheme.com. Those who have 12th house planets, planets in Pisces, or a Gemini sun or Virgo sun will be most intensely affected by this period, though everyone will be affected in some way. Now for the fun part! What exactly do we have in store for the coming month with Mercury turning retrograde? This Mercury retrograde, starting officially February 6th (though you’ll feel waves of it now), is in Pisces. I am personally excited by this because Pisces is the emotion traveler, the diver into the depths, the dreamy siren. Anywhere you go, there will be psychic undercurrents. For those not familiar with these, it can be a confusing time. You may feel like you’re losing your sanity, or perhaps just discovering a whole new layer of existence. GOOD. This is the point. You cannot just idly sit by curled up in your covers waiting for Mercury to turn direct again, you will be thrust into the collective unconscious, and even your covers will turn into bustling waves filling your lungs and forcing you to sit up and cough out all the old to make way for the new. This is the time where the invisible world is very close to our physical world, almost overlapping, which is why communication can get muddled or things we thought were set in stone can dissolve in front of our eyes. The key is to go with the flow. Sometimes it will be rough storms, but other times it will be a steady flowing river. Flow with any of this weather and OBSERVE. This is not the best time to make decisions, but it is a good time to gather information and mull it all over. When flowing down the river, trying to grab onto rocks to steady yourself will just end up spinning you into chaos and leaving you spotted with bruises. You’ll be licking your wounds and miss the wonders that the waters have placed on your path so lovingly. Neptune rules this retrograde, emotions are high. Neptune is sensitive, you will be highly sensitive, but there’s a shield you can pull out any time to keep away from the downfalls. That shield is compassion. Keep yourself equipped inside an aura of compassion for everyone, every circumstance, and yourself. Things aren’t going to go as planned, you have been warned, take that warning and protect yourself from unneeded frustration. Taking advantage of the situation during the Mercury retrograde will bless you with fantastic new insights that will bloom when the retrograde ends on February 28th. By helping others keep their heads up, explaining intentions loud and clear, and utilizing a creative outlet for all that heightened sensitivity, you will be just fine!